Locks and the keys that are paired with them have a long history dating back to the 6th century and ancient cities of the Middle East. Ever since, locks, and the keys that go to them have played an important role not only in our means of security, but also in the evolution of modern day society: No more do we rely on guards to protect our homes, but on high-quality locks and security systems. Locks and keys have also pervaded myth and legend. Today, we are going to take a quick break from our usual locksmith topics to tell the story of the love lock. A love lock is locked padlock that lovers leave on a public structure such as a bridge, fence, or gate. Locking and leaving their love lock symbolizes their love and commitment to one another. Usually, the names or the initials of the lovers are engraved or scratched into their love lock. Bridges, fences, and other public fixtures decorated with love locks can be found all over the world. But, what inspired this tradition? The story of the love lock dates back to more recent history in Serbia during World War I. As with many young couples of the time who were forced into long distance relationships, so was Nada and Relja. Nada was a local schoolmistress and Relja, an army officer. Before, Relja left to fight for the war effort in Greece, he and Nada committed themselves to each other and dreamed of a life full of unbreakable love after the war. Unfortunately, as with many long distance relationships, Relja forgot about his lover back in Serbia and fell in love with a local Greek woman. Shortly after Relja broke off his engagement with Nada, Nada died of a broken heart. Other young women of the area, after hearing about this tragedy inscribed the names of their lover off fighting in the war, on locks and affixed them to the bridge where Nada and Relja used to meet in hopes of protecting their love and seeing their lover once again. 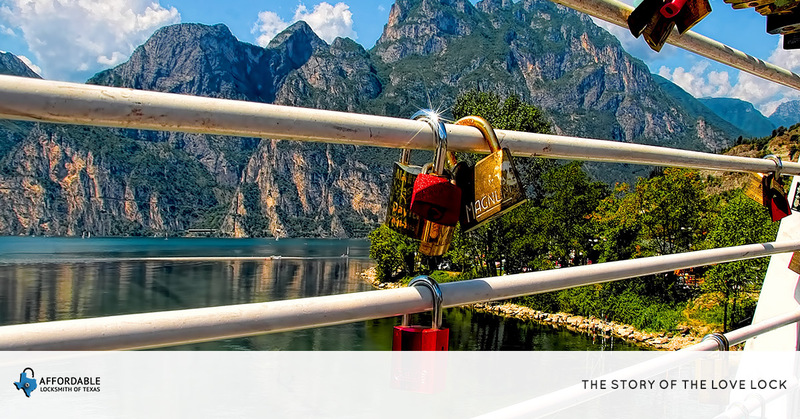 Most Ljubavi, also known as the Bridge of Love is still adorned with locks of those young women and the locks of lovers ever since; Couples from all over the world travel to this famous bridge to celebrate and protect their love and leave their own lock. We hope that you enjoyed learning about the story behind the love lock tradition! Stay tuned for more posts about lock-related subjects that could can help you protect your home, help your business save money, and provide you with helpful security information when it counts. In Need of Locksmith Services in The Woodlands? Though a love lock may protect your love and commitment, it won’t serve the practical purpose of protecting your home in The Woodlands. Protect what’s most important to you through high-quality locks, keyless entry security systems for your home or business, and transponder keys for your vehicle. Affordable Locksmith of Texas offers professional locksmith services to The Woodlands. We are licensed and insured and bring over ten years of experience to every service call. We offer residential and commercial locksmith services, as well as transponder replacement! Contact us to learn more about our services and how we can keep those things most important to you safe! Locked out? No problem! We offer 24 hour locksmith services: Contact us and we will respond within 15 minutes and help you find a solution. New customers get 10 percent off their first service!